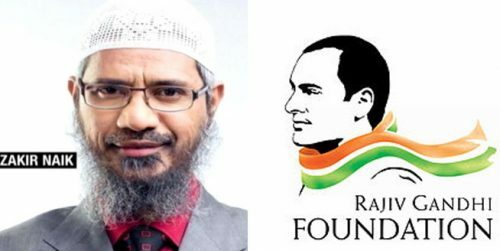 Why Zakir Naik’s Islamic Research Foundation gave 50 lakh donation to Rajiv Gandhi Foundation ? Senior BJP Leader Ravishankar Prasad launched a scathing attack on Congress for the Rajiv Gandhi Foundation accepting Donation of Rupees 50 lakh the by Zakir Naik’s Islamic Research Foundation in 2011. Ravishankar Prasad said it was basically a bribe given to Rajiv Gandhi Foundation to gain favours of the people in power at the time. Referring to a debate in Lok Sabha in December 2012 Ravishankar Prasad said that the then Information and Broadcasting Minister at the time had admitted that Peace TV was a threat to the country. Ravishankar Prasad asked Congress why even after knowing everything it didn’t return 50 lakh rupees to the Islamic Research Foundation in 2012. BJP also questioned Congress compliance with rules and regulations of taking donations. Ravishankar Prasad asked whether the Islamic Research Foundation had taken permission from the Home Ministry for the donation.